The first time I was asked to stand in my kayak as part of a training exercise I couldn't imagine the practical application for such a skill. Over the years I have come to use this skill on many occasions and for different reasons. As I mentioned in this months USK reflections, "Is the kayak afraid? ", standing is a good exercise to help a nervous paddler. Since the average distance we can see toward the horizon is 1.75 miles (due to the earths curvature) while seated in our kayak, standing increases that distance. When I stood in my kayak I had a better viewing angle to help the group negotiate it's way through the channels in the mud flats when paddling in Baja. If you needed to peel off a wet suit you will find sitting on the back deck and/or standing is very helpful. I have also stood in my kayak to climb onto piers, docks, cliffs and other boats. I now believe standing in a kayak is a necessary skill for all paddlers. I encourage you to practice so you can master this skill. You will be surprised how often you will actually use this skill once you take advantage of it. The key to standing in a kayak is your partner's ability to stabilize your kayak so you feel like you have a stable platform. Everyone has their favorite way to hold a kayak and I will give you mine. I feel the bow to stern orientation provides you with the most options for helping your partner. This position keeps you out of the cockpit. It also allows you to watch your partner. As you can see I am lying across my partner's deck just in front of their cockpit. I fully commit myself to lying over my partner's deck. I can hold the kayak with or without a paddle bridge over both kayaks. I find the use of a paddle bridge is more difficult with shorter paddlers. Here is a close-up view so you can see how I position my hands to hold the kayak. Getting a solid grip on the cockpit coaming is essential. You will notice there is plenty of room for the paddler to exit and enter their kayak because I am not blocking the cockpit. You can also see how I lie across the kayak. I am completely supported by my partner's kayak so I have no fear of capsizing. When my partner wants to stand in their kayak I paddle over to them so I can stabilize the kayak. When I am ready I tell my partner their kayak is stable and stand when they wish. Good communication is necessary for this skill. Be sure to never let go until your partner tells you it is OK. In addition, don't let your partner stand until you are ready. Make sure you have good footing before you stand. Standing on your seat is the common place for your feet. Feel free to utilize your partner's upper body to help you stand. You can rest one hand on the stabilizer's head if you need to balance when standing If you lose your balance I recommend falling towards your partner instead of going for the water. Here you can see the paddler who is standing is looking around to see what is out on the horizon. Aside from getting a good leg stretch this paddler could now take off their wetsuit if it were to hot or if they had a nature call. When your partner has had enough standing, they should reverse the standing process in order to get back into their cockpit. Sitting on the back deck makes it easier for both paddlers before sliding back into the cockpit. Once the paddler is back in their seat I will change my hand position from the coaming to around my partner's kayak. This way my hands do not interfere when the spray skirt is being attached to the coaming. Again, I do not let go of my partner's kayak until he or she tells me it is OK. Do not assume your partner is ready. When they say "I am ready, you can let go now" your obligation as a stabilizer is over. You can also stand on the deck of your partner's kayak when you have the support of your kayak across their kayak. This is a clip from the USK article "On Water Kayak Repair." Be sure the deck of your partner's kayak can handle your weight. The new light weight kayaks do a lot of flexing during this drill. Standing in your kayak is not a complicated skill. 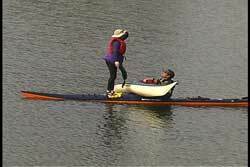 It is an easy one to master as long as you have a good paddling partner who can stabilize you kayak and communicates well. I recommend you practice this skill before you really need it.